Up Leeds and Harrogate Pullman emerging from Hadley Wood Tunnel. GRADUALLY the Pullman car is spreading its influence over the continent of Europe. One day it may corne into use as universally on this side of the Atlantic as it is in the United States and Canada, where every long-distance express without exception carries its Pullman equipment. On the American continent, however, the distinction is merely between “Pullmans” and ordinary “coaches”, there being no class distinctions corresponding to our first and third, and the European first, second and third classes. But already you can start a Pullman journey up in Scotland, and finish it halfway across Europe. Pullman dining cars are at your service over LMS lines between Inverness, Aberdeen, Oban and Glasgow; the “Queen of Scots” of the LNER will bring you luxuriously through from Glasgow and Edinburgh to King’s Cross in London; you can continue from there by the Southern Railway Pullman boat express to Dover and on from Calais to Paris by the famous “Golden Arrow”; whence all-Pullman trains will run you to Brussels and to Amsterdam in the north, Biarritz and the Spanish frontier or the spa of Vichy in the south, the French Riviera in the south-east, and elsewhere. The European Pullman car undoubtedly has come to stay. It was on the Great Eastern Railway, during the regime of its American General Manager - Sir Henry Thornton - that the Pullman car was first introduced to London and North Eastern metals. But the kind of traffic conveyed in the Eastern Counties was not quite “Pullman” enough in character to make a success of the Pullman workings, and apart from the Pullman cars on the Harwich Continental services, the number of passengers using the cars was not sufficient to justify their continuance. 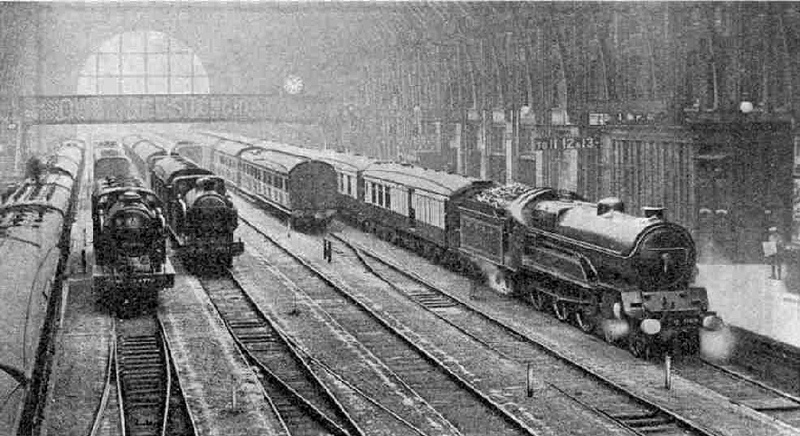 In casting about for a suitable way in which to use the Pullmans the London and North Eastern officials bethought them of the famous spa at Harrogate, and it was decided to assemble a number of the cars into a complete Pullman train and run it between King’s Cross and Harrogate as a train-de-luxe. Leeds and Bradford were to benefit by making the tram non-stop between London and Leeds, and by the working of two of the cars through beyond Leeds to Bradford. The experiment was an immediate success. The “Harrogate Pullman” thus came into being, and the palatial train of umber and cream cars became a familiar sight on the Great Northern main line. Shortly after this the working of the train was extended to Newcastle. Another all-Pullman service that was tried did not work so well. A “Sheffield Pullman” was put on, coming up in the morning non-stop from Sheffield to King’s Cross and returning in the evening. Later on this train was diverted via Nottingham, and run from there over the Great Central route into Sheffield, whence it was extended to Manchester; but still the public were shy of patronising it. Once again an alteration was made, by which the “Harrogate Pullman” was also affected. Leeds and Bradford were cut out of the latter train’s itinerary, and it was accelerated to run non-stop over the 198¾ miles between King’s Cross and Harrogate - at that time the longest non-stop journey on the LNER system. This alteration took the “Harrogate Pullman” over a section of the LMS lines, from Shaftholme Junction, just north of Doncaster to Knottingley, after which followed some most tortuous travelling with many curves and severe slowings. not to mention steep gradients, past Ferrybridge, Burton Salmon, Church Fenton and Tadcaster up to Harrogate. As compared with the 165 minutes allowed the train to passing Doncaster, 156 miles from King’s Cross, the difficulties of the next 42¾ miles entailed an allowance of no less than 58 minutes, and 3 minutes less on the up journey. Needless to say, the up time of 3 hours, 40 minutes thus instituted on the up working between Harrogate and King’s Cross was by far the fastest ever known between the Yorkshire spa and London. 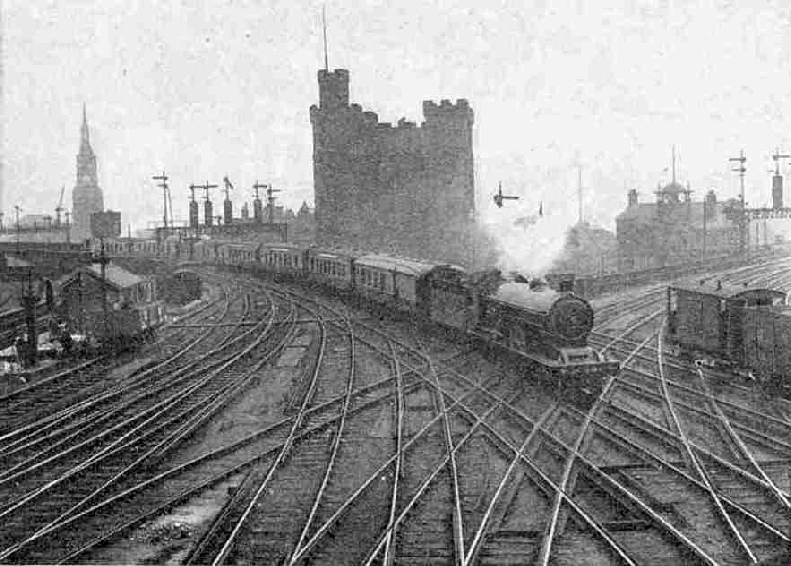 An extension of the journey at the northward end was brought into force at the same time, a Pullman train of the LNER for the first time crossing the Border and bringing up in the capital city of Edinburgh. To celebrate this change the name was changed to the “Harrogate and Edinburgh Pullman”. But what about Leeds and Bradford? From this time forward they had their own independent service. The Sheffield train was diverted to Leeds instead, leaving London just ahead of the Edinburgh train, the two departures from London being at 11.10 and 11.20 a.m. To give a quicker service to Bradford, the “West Riding Pullman”, as this new train was called, stopped first at Wakefield, instead of Leeds, and from Wakefield two Pullmans were run direct to Bradford and from there on to Halifax, so that four important West Riding cities thus came into possession of their own express Pullman service to and from London. In each case, too, the times instituted to and from London were considerably faster than those by any other train, either of the LNE, or the LMS companies, so that the passenger obtained exceptional speed as well as exceptional comfort in exchange for the supplementary Pullman fare demanded. And now, from the beginning of last month, a new and very important rearrangement of the two trains has taken place. The only drawback has been the slowing of the best time from London to Harrogate by 17 minutes, and the best time up by 19 minutes. But by way of compensation Leeds has now two Pullman expresses daily in each direction to and from town in the splendid time of 3 hours 25 minutes, two of them non-stop and the other two calling at Wakefield. Harrogate similarly has two four-hour Pullmans both ways to and from London daily, while Leeds and the West Riding also get a through Pullman service to Scotland. The down Scottish Pullman express - which has now changed its title from “Harrogate and Edinburgh Pullman” to the more alluring “Queen of Scots Pullman” - splits the difference between 11.10 and 11.20 a.m. by leaving at 11.15 a.m, and runs direct to Leeds and thence to Harrogate. North of Harrogate, by omitting the Ripon and Berwick stops, and by some speeding-up, the “Queen of Scots” is brought into Edinburgh at the same time of 7.35 p.m. as before, after which it is run forward to Glasgow. On the return journey it leaves Glasgow at 10.5 a.m, and Edinburgh at 11.15 a.m. - a much more convenient time than the early hour of 8.30 a.m. - and runs into King’s Cross, by the same route, at exactly the same time as the north-bound “Queen of Scots” makes Edinburgh. 4.45 p.m. and arriving at Leeds at 8.16 p.m, after which it is run forward to Harrogate. Thus Harrogate and Leeds have now a morning and evening Pullman service both ways. Another advantage of this rearrangement is that it enables one train to do the return “West Riding” trip each day, arriving at King’s Cross at 3 p.m. and going down at 4.45 p.m. The up “West Riding”, in order to maintain a time of 3 hours, 25 minutes from Leeds to King’s Cross, inclusive of a stop at Wakefield to attach the Halifax and Bradford portion, is now booked to make the fastest long -distance run on the LNER system, covering the 175.7 miles between Wakefield and King’s Cross in 183 minutes, at an average speed of 57.6 miles an hour. But the fastest intermediate average is kept up by the down Pullmans, which are both booked to cover the 138¼ miles from Hatfield to Doncaster in 140 minutes. When allowance is made for the severe slowing through Peterborough, this timing entails an average rate of over 60 miles an hour for this long distance. Several types of locomotives have been tried on these high-speed journeys, including both the large four-cylinder “Valour” class 4-6-0’s and the “Director” 4-4-0’s of the Great Central section; but the most successful results, both as regards time-keeping and economy in fuel consumption, have been achieved by those wonderful Great Northern “Atlantics”. Though the type has been in existence now for over a quarter of a century, these remarkable machines, like Peter Pan, seem strongly disinclined to “grow up”. I have recorded runs behind them when time has been kept with loads that would not disgrace the best efforts of a “Pacific”. 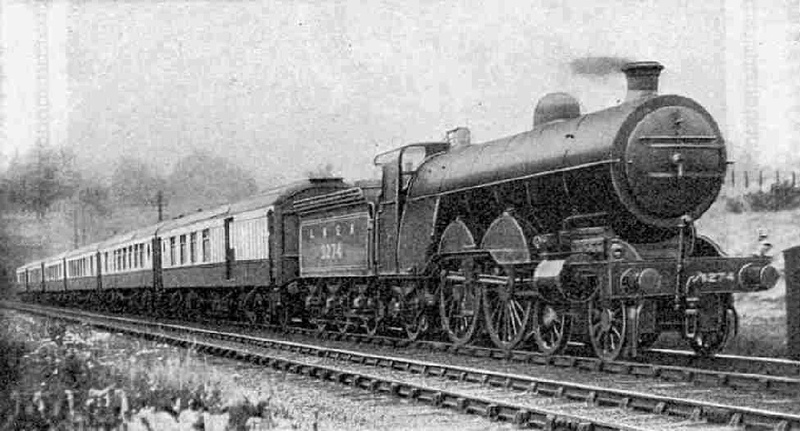 On these “Pullman” turns, where speed rather than load is the chief consideration, the “Atlantics” have a splendid reputation; indeed, by the efforts of the capable and enthusiastic “link” of drivers to whom their working has been entrusted, they have probably the best punctuality record of all express trains on the LNER. On several occasions time lost by circumstances not under the driver’s control has been regained in an exceptional fashion, as, for example, when on a recent trip, slacks for engineering works caused the up express to be 13 minutes late in passing Peterborough, after which the remaining 76½ miles to town were covered in the extraordinary time of 68 minutes, and the train reached London on time! When Mr. H. A, Ivatt built his pioneer “Atlantics” for the Great Northern Railway, in 1898, they were the first engines of this wheel arrangement to be introduced into the country. His earliest batch had small boilers, but in 1902 there appeared No. remains, and in every other respect the locomotives are practically as first built. There are two unusual engines of the class, however, which frequently take their turn in the Pullman “link”. One is No. 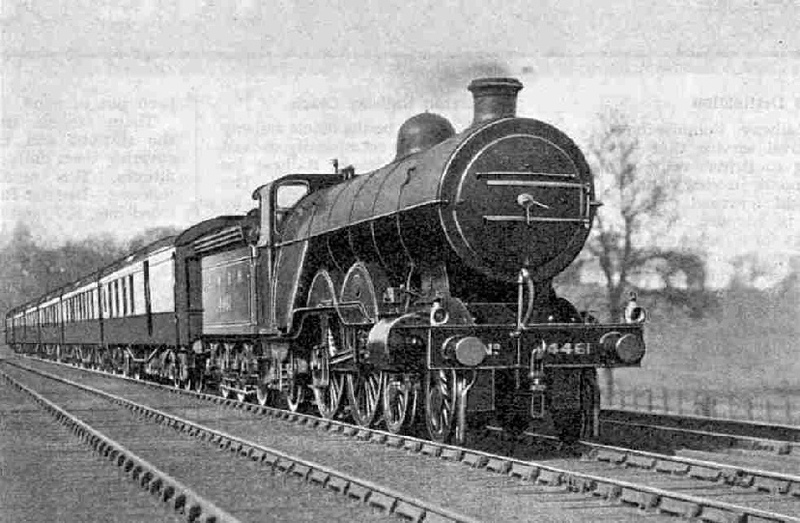 3279, which Mr. Ivatt rebuilt experimentally with four cylinders instead of two. This engine is easily recognisable as the only LNER “Atlantic” with outside Walschaerts valve-motion, and there are certain other external differences in the framing above the coupled wheels. Then there is the still more interesting No. 4419, which has been fitted with an American “booster” engine, driving the small pair of wheels under the cab. This ingenious mechanism consists of a small two-cylinder engine, supplied with steam direct from the boiler - by means of a rather unsightly pipe running along the side of the boiler above the wheels - which gives the locomotive valuable assistance at the moment of starting. As soon as the train gets into speed the driver is able to cut out the booster engine completely by means of a gear, the action of which corresponds to the free wheel clutch of a bicycle. The engine then proceeds in the normal manner. The idea is to give a “boost” at starting, when it is most wanted, and then to cut out the booster cylinders, so that they may not prove a drain on the boiler steam supply, nor oppose frictional resistance at high speeds. By successful remodelling, the booster engine on No. 4419 has been arranged so that it can be cut in and out at speeds as high as 25 miles an hour or so, which makes it available on steep gradients as well as at starting. No. 4419 is also recognisable as being the only “Atlantic” to boast a large cab, with high roof and side-windows. The maximum load laid down for the Pullman workings, on account of their high booked speeds, is one of eight cars, which makes a total of a little over 330 tons. You may wonder why the “Pacific” engines are not employed on such important trains, especially as by their use loads might be increased; but there are one or two weak bridges between Doncaster and Leeds, and until they have been replaced the “Pacifics” are barred. But in all probability a “Pacific” will be awaiting us at Leeds, to take us forward on our journey from there. The usual formation of the train on leaving King’s Cross is a third-class Pullman brake coach next the engine; then a couple of third-class cars, followed by two palatial first-class cars furnished with comfortable arm-chairs and beautifully decorated internally; then one more third-class car, and a third-class brake car bringing up the rear. One of the special features of these all-Pullman trains is that the passenger’s meals are brought to him, no matter where he sits from two or three kitchens strategically disposed throughout the train, instead of his being compelled to leave his seat and repair to the restaurant car. This arrangement, of course, entails a considerably larger train-staff than is carried on any ordinary express, but it is part and parcel of the luxury travel that is associated with the name “Pullman”. Most of the cars are carried on eight wheels, a new type of 4-wheeled bogie having replaced the previous 6-wheeled standard, but even the 8-wheeled cars turn the scale at 40 tons. The “Queen of Scots Pullman” Car Express entering Central Station, Newcastle-on-Tyne. It is hauled by NE Class “Z” three-cylinder 4-4-2 engine No. 733. The train is passing over the special layout assembled from Hadfield’s Manganese Steel Crossings. We have travelled previously over a great part of the route, both on the north-bound journey with the “Flying Scotsman” and also coming south on the “Aberdonian”, but readers may welcome a recapitulation of the features of the journey. So far as concerns the first non-stop spin, from London to Leeds, the worst gradient occurs in the initial 1½ miles out of King’s Cross, which not only rise at between 1 in 105 and 110, but also through a couple of tunnels where the rails are always greasy with moisture, so that the engines incline to “slip”. Once through Holloway, however, all is plain sailing, and some six minutes after starting we are passing Finsbury Park at 40 miles an hour or so, rapidly accelerating. Five miles from the start, at Wood Green, we have nearly reached the mile-a-minute rate, but here there begins a rise for nearly eight miles at 1 in 200, to Potter’s Bar, up the major part of which the speed will drop to between 40 and 45 an hour. The engine is not being hurried, as the timetable gives a fairly generous allowance of 25 minutes for the first 17¾ miles to Hatfield. Tunnels are a constantly recurring feature of this first section of the journey, there being no less than nine in the 24 miles from King’s Cross to the summit point of the “Northern Heights”, at Woolmer Green, between Welwyn and Knebworth. Welwyn Viaduct, across the Mimram Valley, is another noteworthy engineering achievement, with its 40 arches at a maximum height of 100 ft above the valley. From Hatfield to Peterborough the timetable allows 56 minutes for the 58¾ miles, and of this distance the 27 miles from Hitchin to Huntingdon are booked to be covered in 24 minutes, at an average of 67½ m.p.h. It is quite possible that we shall cut this time and attain a speed of 80 miles per hour or over on the tempting downhill stretch past Three Counties and Arlesey. Water is taken from the troughs at Langley, near Stevenage, and the next opportunity is not until Werrington Junction, some three miles beyond Peterborough. The sharp curve through Peterborough Station entails a reduction of speed to 15 or 20 miles an hour. For the next 29 miles to Grantham the time allowed is 33 minutes because, after a level stretch past Tallington to Essendine, the engine has to climb for 12 miles to the summit at Stoke Box, largely up grades of 1 in 200 and 1 in 178. Stoke is exactly 100 miles from King’s Cross, and with its 420 ft of altitude is the highest point on the route, south of Leeds. More “galloping” now lies ahead. Threading the short Stoke Tunnel, we are through Grantham five minutes later, having taken 114 minutes over the 105½ miles from London. The next 50½ miles to Doncaster must be covered in 51 minutes, including the short climbs over the summits at Markham, beyond Tuxford, and Piper’s Wood, after Bawtry. On this stretch we take water twice, from troughs in the Trent Valley, beyond Newark, and at Scrooby, the village distinguished by having been the home of the “Pilgrim Fathers” before their departure for America. Two interesting railway features on this section are the level crossings at Newark and Retford over the LMS and LNE (Great Central Section) Nottingham to Lincoln and Sheffield to Grimsby lines. As the old Midland Company was the first in the field in the former cause, the LMS signal-box controls the crossing, and it is diverting to think that the LMS signalman there has it in his power to hold up the non-stop Edinburgh flight of the rival company’s “Flying Scotsman”, though it is to be trusted that he will not exercise his rights! At Doncaster we slow for the second time, in order to leave the East Coast main line for the West Riding direction. Between here and Leeds there are some heavy grades. From Adwick to beyond South Elmsall (160-165 miles) the rise is at 1 in 440-200, but after that it steepens to 1 in 150, to a summit near Nostell. A swift descent then brings us through Sandal to Wakefield, where another severe slack is made. There is now a five-mile climb ahead, mostly at 1 in 100, to Ardsley, the highest point on this section, after which we drop at 1 in 100 into Beeston, and run slowly through Holbeck into the Central Station at Leeds. For the 19¾ miles from Doncaster to Wakefield 22 minutes are allowed, but the difficult 11 miles of the Wakefield-Leeds stretch require 18 minutes, making 205 minutes for the 185¾-mile run of our “Atlantic” from King’s Cross. As at Wellington Station of the LMS in Leeds, so here at Central our train is now reversed, and we shall pass our engine for the north-bound run just as we are running in. It may be one of the “Z” class three-cylinder “Atlantics” of the North Eastern Area, but in all probability it is a “Pacific”, for whom our 300-ton train, gradients notwithstanding, is but a feather-weight. A very slow start has to be made. Immediately after leaving Leeds Central, at 2.45 p.m, we diverge sharply to the right and run down to Geldard Junction, whence for a short distance we must seek the hospitality of LMS metals - the Midland main line from Leeds to Carlisle, just beyond Holbeck - in order to get on to the LNE line for Arthington. Past Headingley and Horsforth we climb at 1 in 100 for five miles, rising from an altitude of 115 to 391 ft in the first 6¼ miles out of Leeds. This is the preliminary to the gloomy portal of Bramhope Tunnel - with its 2¼ miles of length, the second longest bore on the LNER - down through which, on a falling grade of 1 in 94 for three miles, we hurry to Arthington, 218 ft above sea-level. Then comes a climb of 3¾ miles at 1 in 195, followed, after a brief respite through Pannal, by ¾-mile at 1 in 114 to Crimple Junction, where we pass at a snail’s pace around a curve of extraordinary sharpness on to Crimple Viaduct, and a mile at 1 in 91 up to the 400 ft altitude of Harrogate. It is small wonder that this 18-mile stretch needs half-an-hour for its negotiation. Harrogate is reached at 3.15 p.m, 4 hours after leaving London. The “Queen of Scots” about to leave King’s Cross. 4-cylinder GC type engine No. 6164 “Earl Beatty”. Leaving at 3.20 p.m, we have in the next nine miles to drop all but 300 ft, first for 1½ miles as steeply as 1 in 66, and for three miles from Wormald Green at 1 in 133, so that 14 minutes prove ample for the 11½ miles from Harrogate to passing Ripon. A level run onward brings us to Northallerton, where we rise to rejoin, at reduced speed, the East Coast main line, which we left at Shaftholme Junction, 58 miles farther south. It is interesting to note that our detour has added only 11 miles to the journey. Water is taken from Wiske Moor troughs, just beyond Northallerton, and at 4.7 p.m. we reach Darlington, the 39½ miles from Harrogate having taken 47 minutes. Two minutes suffice at Darlington, during which time the astonishing contrast may be noted between the “Pacific”-hauled Pullman express of 1928 and little “Locomotion No. 1” of the 1825 Stockton and Darlington Railway, mounted on his pedestal in the station. After this follows the difficult 36½ miles to Newcastle, with its sharp ups-and-downs, some quite steep, like the 1 in 150-163 from Croxdale to near Durham. Reduced speed may be necessary at one or two points where colliery subsidences are giving trouble, and a very severe slack is made over Durham Viaduct. Darlington to Newcastle requires 48 minutes, and we arrive there at three minutes before 5 o’clock. During the seven-minute halt our engine is probably changed for another “Pacific”, and at 5.4 p.m. we set out on the second non-stop stage of the journey, which exceeds 100 miles in length. It is over the 106½ miles to Drem, north of the Border, where connection is made to the golfing resort of North Berwick. The time allowance of 124 minutes entails an average rate of just over 50 miles an hour, over what is a fairly easy course. The worst ascents are the eight miles, mostly at 1 in 200-224, to Cramlington, shortly after the start; the 3¾ miles up at 1 in 170 from Alnmouth; and then nearly six miles up at 1 in 190 along the sea-cliffs past Berwick, during the course of which we make our way across the famous Royal Border Bridge, 90 ft above the waters of the Tweed. Beyond the last-mentioned rise there in an eight-mile bank, largely at 1 in 200, leading up to Grant’s House summit, 391 ft above the sea. Then comes the severe descent - 4½ miles at 1 in 96, known as Cockburnspath Bank, which is the terror of drivers of heavy up trains. Here speed will be moderated. The highest speeds over this section will be attained, probably, between Christon Bank and Chathill, and near Beal, where quite probably our maximum rate may reach 70 to 75 miles an hour. After Cockburnspath comes Dunbar, and fairly easy undulations on to Edinburgh. The Drem stop is but brief, and at round about 7.30 we are crossing the complicated switches and crossings at Portobello, preparatory to running up the final 1 in 78 through Calton Hill Tunnel into the Waverley Station. The time of arrival is 7.35 p.m.
Glasgow Railway managed to preserve, as far as the Northern suburbs of Glasgow, a course that is to all intents and purposes perfectly flat throughout. This is in striking contrast to the tremendous grades of the rival LMS route, which takes a location further to the south. Leaving Edinburgh at 7.42 p.m, our engine maintains across Scotland an average rate of round about 60 miles an hour, and despite a stop at Falkirk, and a couple of slowings for colliery pitfalls, we approach Cowlairs, 46 miles from Waverley, at about 8.38 or 8.39 p.m. The ample margin left for the last 1¼ miles is on account of the precipitous drop at 1 in 42 through the tunnels into Queen Street terminus, which has to be taken at the most cautious speed. Until well into the present century, descending trains were all provided with special “brake-trucks”, for additional brake-power, and outward-bound trains were pulled to the summit of the bank by wire ropes, but bank engines now perform the latter duty, and the former precaution is abolished. So, at a quarter to nine in the evening, having covered 451 miles from King’s Cross, the “Queen of Scots” stops in Queen Street Station, Glasgow, her beautiful cars imparting an unusual touch of brightness to that deep-lying and dingy terminus. We have taken part in the longest continuous Pullman journey that these islands afford, and a considerably longer spell of travelling than 9½ hours in such palatial conditions would hardly have tired us. A recent photograph of the up “Queen of Scots” near Hadley Wood. Engine No. 4461. You can read more on “The Aberdonian”, “The Flying Scotsman”, “The Great North Road of Steel” and “The Midland Scotsman” on this website.